Latin Cigars de Nicaragua S.A. 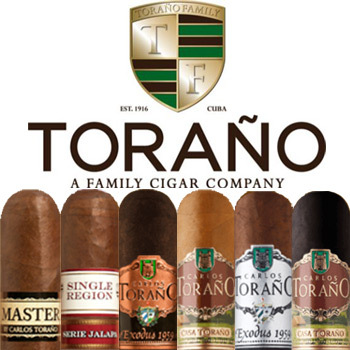 The Torano Cigar family is internationally known for their behind the scenes of tobacco brokering for all cigar companies such as CAO, Dunhill, Graycliff Cigars, etc. The Torano family started their own cigar lines, such as the Exodus 1959 Silver Edition, which has received numerous awards and high ratings from all cigar magazines alike. The Casa Torano cigar was an instant success when the it was launched at the 2006 RTDA trade show. Casa Torano cigars have a mild to medium bodied taste, that will be sure to please any cigar enthusiast. The Torano Master cigar was released in 2010 and is already considered a legendary cigar for its rich creamy taste, perfect draw, and long finish, so be sure to try out a Torano Master or any Torano cigar today.